Why Do They Do It – Is It Just Me? Another in the “why do they do it – is it just me ? ?” series of rants. I totally understand why hotels need to have their buffet breakfast food offerings on a table. It’s so that the guests can peruse the various tasty morsels – obviously. BUT why oh why do they have to have them displayed at child nose/mouth height? Do they measure the standard height of a 7 year old and then build a buffet table to the equivalent height or do they just guess how tall to build it… just to hack off the adult guests? Is it too much to ask to have the food covered up or set well back – far enough back to stop the odd little tongue from licking an over hanging crumpet? 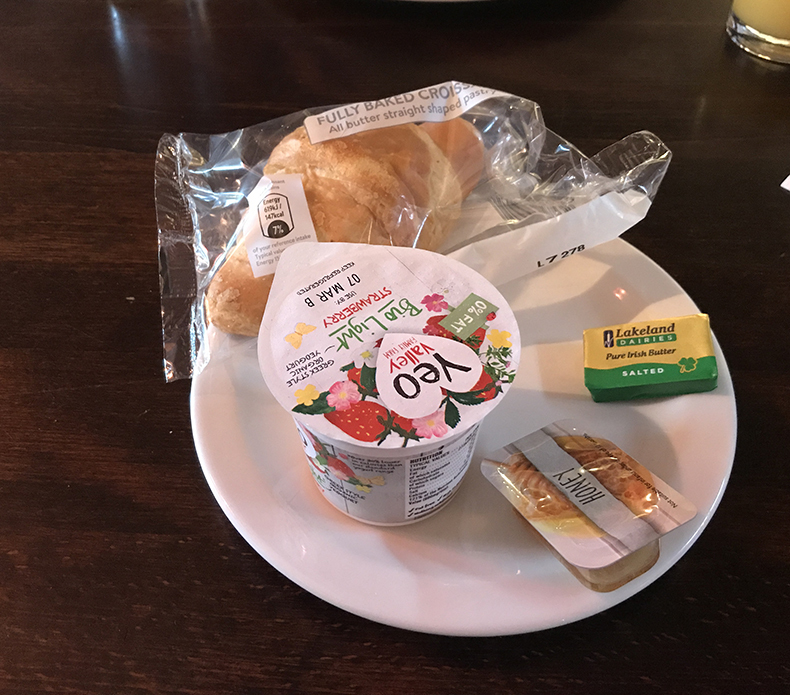 My friend Lynne and I booked into a hotel very close to Peppa Pig World and over the last 4 days I have watched, with horror, as child after child picked up the food, had a quick look at it and then put it back on the plate. One little chap, after excavating the far reaches of his nose pointed to and then touched one or two buns which HE wanted but his mum didn’t want him to have. So after a minor strop and a threat of being taken home, the well handled buns were put back on the plate for another guest to nibble. Thanks for covering them in snot little fella ! These Peppa Pig devotees seems to have a variety of coughs, colds and snuffles which they very generously breathed over the breakfast feast. A good few enjoyed the odd sneeze and found that it was more satisfying to perform said sneeze just 2” away from a chocolate muffin – mmmmmmm, Yum yum. They fished in the fruit bowl for their favourite piece of pineapple – and sometimes they even used a spoon. Some picked up an unfamiliar crumpet to look at the holes and one or two put their hands into the rotating toaster to retrieve their toast! I was amazed how much food these kids could hoover up – they just kept coming for more. Were they hungry or was it just the novelty of messing with the food and the other guests heads? Where were the parents I hear you ask….. well, in most cases they were standing next to them. 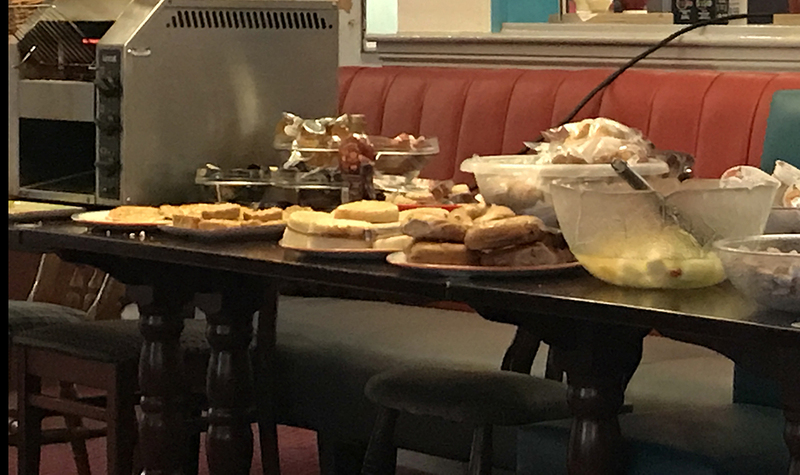 Very few ensured that their children’s grubby germ laden fingers didn’t touch the food -they seemed more involved in just getting through another mind numbing day with the pig family (and I’m not talking of Peppa Pig this time) ! You may be asking what I had for my breakfast – well as you can see….. everything was well wrapped up !! Couldn’t agree more Joan and it’s not just kids. My favourite vanilla slices are served by a woman who insists on picking them up with her thumb in the middle of the icing.